Ephrata Cloister, Landis Valley Village and Farm Museum, and Railroad Museum of Pennsylvania are participating TODAY in the Lancaster County Community Foundation’s Extraordinary Give, a 24-hour online fundraising marathon. Based on designated donations to each participating organization (www.extragive.org), the Foundation will distribute an additional $250,000. (If you’re not in Lancaster County and would rather support a Trails of History site closer to home, that’s cool too—they’re all listed here and they’ll be happy to receive a donation.) Thank you for your support. Please note that a number of sites are now (or soon will be) on their winter schedules, which means they are open fewer days or closed to the public except by prior arrangement. It’s always a good idea to check the schedule before you go, but it’s really a good idea this time of year. All sites will be closed on Dec. 25, with the exception of Washington Crossing Historic Park (see below). Dec. 1: Christmas in a Small Town—Also known as the Santa Train, this program is sponsored by the Lackawanna Heritage Valley National and State Heritage Area in partnership with a bunch of organizations including the Museum. The public is invited to welcome Santa at various stops and board the train for a visit (train rides not included); for details, go here. Dec. 16: Battlefield Movies—John Adams, the 2008 mini-series from HBO Films starring Paul Giamatti in the title role and Laura Linney as Abigail Adams. 1 pm. Dec. 2: Christmas Open House—This annual event also includes a book sale. Friends of Conrad Weiser Homestead receive a 20% discount on purchases, others receive 10% (sounds like a good reason to join, if you ask me). Noon-4 pm. Dec. 1, Christmas at Cornwall House Tour—This annual tour lets you explore private homes in the Cornwall/Lebanon area while supporting the Friends of Cornwall Iron Furnace. Tickets are $15 in advance or $20 on the day of the tour (which, okay, is tomorrow); they’re available at the Furnace. Tour booklet includes a discount coupon for the Timeless Café in Lebanon. Go here for more info. 10 am-4 pm. Dec. 9: A Homestead Christmas—Explore English and German Christmas traditions, enjoy hot chocolate and wassail, visit with Santa, and shop for baked goods and gifts for the history-minded folks on your list. Noon-4 pm. Dec. 15: Santa’s Workshop—Children in grades 1-5 are invited to make a craft, watch a holiday movie, shop for gifts for family and friends, and share a snack. Registration is required ($5 fee per child); call the museum at 814/827-2797 to sign up. 1-3 pm. Dec. 1-2, 8-9: Victorian Christmas—This program takes place in the 1861 Sharpe House and features Victorian decorations, tea, and cookies. Ornaments and teacups will be available for purchase as part of this fundraising event. Noon-4 pm. Dec. 10-11: Christmas at the Cloister—This popular annual program combines traditional music (sung by the Ephrata Cloister Chorus) and readings. Tickets are limited and may be sold out by the time you read this; call 717/733-6600 or check Ephrata’s Facebook page here. 6:30, 7:45, 9 pm. Dec. 26-29: Lantern Tours—Tour the site and follow the story, presented by junior and senior high school students under the guidance of museum staff. Tours start every half hour and leave from the visitor center. Reservations are required; tickets go on sale tomorrow (Dec. 1). Call 717/433-6600 to reserve your spot. 6:30-8 pm. Dec. 14: Christmas Tree Ship—Inspired by the story of the schooner Rouse Simmons, this program features Niagara lit up for Christmas, a visit with Santa, and a chance to do something nice for others. Admission is free and open to the public. Please bring new or gently used lights and/or ornaments to help decorate trees that will be provided to members of the community (the museum works with Erie’s Crime Victims Center and Multi-Cultural Center to select recipients). 5:30-8:30 pm (ship lighting at 5:45). Dec. 8: Hearth and Home Cooking Series—Taught in the summer kitchen of the Keith House, this program focuses on the seasonal availability of foods in southeastern Pennsylvania. Advance registration (with payment) is required by Dec. 6 (additional classes will take place on March 9 and May 11); call 215/343-0965. 10:30 am-2 (or 3) pm. The Pennsylvania Long Rifle exhibit, originally slated to close on Dec. 31, has been extended through June 10, 2013. Dec. 1-2, 8-9: Country Christmas Village—Enjoy a Pennsylvania German Christmas, with all kinds of trees (including upside down), an elaborate miniature village scene, a visit from Belsnickel (Santa with attitude), plus complimentary cocoa and gingersnaps. Included in regular admission. Dec. 1 & 8, 10 am-4 pm; Dec. 2 & 9, noon-4 pm. Dec. 5: Days of the Belsnickel Dinner Tour—Start with some shopping in the Weathervane followed by wine and cheese in the visitor center, take a horse-drawn wagon ride, and enjoy a traditional turkey dinner in the Landis Valley Hotel. Oh, and spend some time with der Belsnickel, who’s sure to be a cranky addition to the party. Reservations required (sign up by Monday, 12/3); call 717/581-0431 or email c-jperkins@pa.gov. 5:30 pm. Dec. 8: Days of the Belsnickel Lunch Tour—Tour the village to see the holiday decorations and open hearth cooking, then enjoy a traditional home-cooked meal and shopping at the Weathervane. Der Belsnickel will be on hand to liven things up. Reservations required (no later than Monday, 12/3); call 717/581-0590 or email c-jschurin@pa.gov. 11 am. Dec. 14: Holiday at Landis Valley Bonfire—What’s not to like? Caroling, a blazing bonfire, wagon rides, hot cider and cookies. And it’s free—Landis Valley’s gift to the community. Return the favor by bringing nonperishable food items for the local food bank (truck will be parked by the Visitor Center for easy drop-off). 6-8:30 pm. Dec. 22: Old Fashioned Children’s Christmas—This year’s theme is gingerbread; children can decorate gingerbread cookies, make gingerbread-based crafts, and hear the story of the Gingerbread Man in the one-room schoolhouse. Included in regular admission (no reservations required). 10 am-3 pm. Dec. 27-28: Winter Day Camp—A great way to keep everyone happy and sane during school break. The theme this year is the North Pole, and days will be filled with fun and activity. Cost includes snacks and a hot lunch each day. Discounts available for Landis Valley Associates members and for multi-day registrations. Call 717/569-0401 x228 or email c-sbrown@pa.gov. 8:30 am-4:30 pm. Dec. 8-9: Christmas at the Village—Enjoy Christmas carols sung by local choirs, shop for handmade wares by local craftspeople, and stop by the Granary for children’s activities and to see whether Belsnickel’s book has you down as naughty or nice. Please start at the Visitor Center to purchase tickets and then take a horse-drawn carriage to the village. Dec. 8, 2-9 pm; Dec. 9, 2-7 pm. Dec. 1: Wreaths & Greens Workshop—Make a fragrant and festive wreath and learn tips on caring for evergreens in your home landscape. Registration is required; call 215/946-0400. Please bring your own clippers. Morning session, 10 am-noon; afternoon session, 1-3 pm. Dec. 6-7: Holly Nights—A special opportunity to see Pennsbury by night with candlelight, bonfires, and hearth fires. Enjoy caroling, hot cider, and throwing a green sprig on the Yule log bonfire for luck. Click here for details and to download a discount coupon. 6-9 pm. Dec. 7: Pearl Harbor Remembrance Day Tribute—Gather with others beneath the guns of the USS PENNSYLVANIA (adjacent to the museum parking lot) to mark the 71st anniversary of the attack on the US Pacific Fleet at Pearl Harbor, Hawaii. 12:45 pm. Dec. 1 and 8: Home for the Holidays—Costumed engineers, conductors, ticket agents, and passengers representing the past century bring historic rail travel to life. Kids can visit with Santa or work with a telegrapher to send a Christmas telegram to the North Pole. Holiday music, refreshments (while supplies last), and shopping are part of the day too. Click here for more info. Included in regular admission. 9 am-5 pm. Dec. 30: Final day to see the Museum’s 2012 special exhibit, “The Role of Railroads in Pennsylvania During the Civil War.” Noon-5 pm. Through Dec. 20: 3rd in the Burg Gives Back—The Museum is a drop-off point for donations of canned and other nonperishable food items for Harrisburg’s Ecumenical Food Pantry. Donors receive a discount coupon for the Museum Store. Donations accepted during regular operating hours. Dec. 15: Kwanzaa and Christmas Celebration—A collaboration of Nathaniel Gadsen’s Writers Wordshop, American Literacy Corp., Ksongz, Inc., and Life Esteem, Inc., this program is a celebration of family. Food, music, workshops, and more. Admission is free. 10 am-3 pm. Dec. 27: Noon Year’s Eve—Ring in 2013 a few days early at this popular program for young children and their families. Dancing, crafts, and snacks leading up to the big drop in Memorial Hall at noon. Included in regular admission. 10 am-noon. Dec. 9: Dress Rehearsal—Historical demonstrations, activities, and the final rehearsal for the reenactment of the Christmas 1776 crossing of the Delaware by Gen. Washington and Continental troops. Admission charged. 10 am-4 pm (crossing is scheduled for 1 pm). Dec. 25: 60th Annual Christmas Day Crossing—Thousands of folks will be on hand to watch as Gen. Washington (portrayed by John Godzieba) and three Durham boats full of reenactors cross the Delaware River (weather permitting). The event is free to the public. 1 pm. This year, I’m thankful for my husband, my mom, my brother, and all the rest of my family—in-laws, nieces, nephews, aunts, uncles, and cousins of all varieties. I’m thankful for new friends and colleagues and thankful for old long-time friends and colleagues. I’m thankful for good health and a happy home. I’m thankful for Trailheads readers (many of whom fall into other categories already noted). 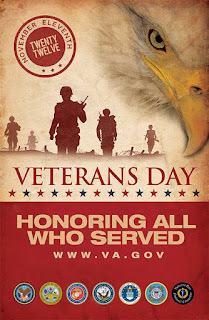 And I’m thankful for the opportunity to share with you the good work that goes on every day on the Trails of History. What are you thankful for this year? Most sites are closed today, but if you feel the need to get everyone (or just yourself) out of the house, you should find Fort Pitt Museum, Pennsylvania Military Museum, Railroad Museum of Pennsylvania, and Washington Crossing Historic Park (with the exception of Bowman's Hill Tower) open. (As always, it's a good idea to check ahead just in case there's been a change.) On Saturday, all sites will be on their normal schedules, and shopping in our museum stores is a great way to celebrate Small Business Saturday. 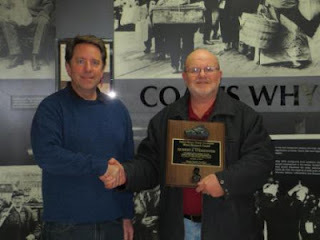 In keeping with today’s theme, I’ll mention that Eckley Miners’ Village Associates recently presented their inaugural Black Diamond Award to the organization’s immediate past president, Robert Vybrenner. The award was initiated to honor and recognize meritorious service in support of the Village, its programs, and its mission of preserving and sharing with the public the heritage of the anthracite coal region. So I’ll add to my list of things I’m thankful for all of the people who give their hearts and their energies to keeping the Trails of History vibrant. Thank you! Did you know that today is Museum Educator Appreciation Day? We’re not exactly sure where we got this, but it was started by a former director of the Bureau of Historic Sites and Museums (curators get appreciated in February). So I’d like to take this opportunity to thank all museum educators, but especially my colleagues on the Trails of History, for their hard work, their dedication to our visitors, and their perseverance. I’m honored to work with you. At the Erie Maritime Museum and US Brig Niagara, Cover Day marks the beginning of winter as surely as the solstice, ubiquitous holiday music, or the influx of catalogues in your mailbox. Senior Captain Walter Rybka describes it as “the closest thing we have to a barn raising.” Crew, staff, and volunteers worked together on Nov. 10 to erect the wooden framework and attach the canvas that protects Niagara’s deck from snow, sleet, and rain until sailing season comes again in the spring. Thanks to John Baker for sharing the photo above. In time for Veterans Day, the Centre Daily Times ran a feature article about the 2012 foodways theme exhibit at the Pennsylvania Military Museum. 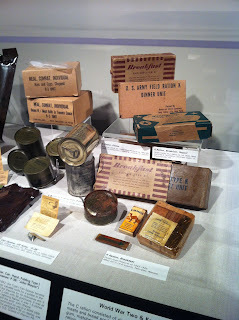 The temporary exhibit highlights combat rations from various eras and explores how soldiers were and are fed while in the field. Each year, PMM adds elements to their ongoing exhibit to reflect that year’s PHMC theme. You have until the end of November to catch this year’s offering before the museum closes for the winter (except for Pearl Harbor Remembrance Day on Dec. 7). After that, you’ll just have to wait for the 2013 edition (PHMC’s theme next year is the Civil War and the centennial of the PA Historical Commission). STORM UPDATE: Washington Crossing Historic Park reports that a normal operating schedule is back in place for the temporary Visitor Center, historic buildings in the Lower Park, and the Thompson-Neely House in the Upper Park (assuming the nor'easter hasn't changed that). However, the work to restore electrical service to Bowman’s Hill Tower is not yet completed. We’ll keep you posted when the Tower is able to reopen for visitors. As far as I am aware, all other Trails of History sites are operating under their normal schedules for this time of year. Most sites will be closed this Sunday, Nov. 11, for Veterans Day, but Fort Pitt Museum, Joseph Priestley House, Pennsylvania Military Museum, Railroad Museum of Pennsylvania, and Washington Crossing Historic Park (with exceptions noted above) will be open. The Daniel Boone Homestead Spinner’s Guild will present a program on “Plant Fibers in Colonial Times” at 2 pm in the DeTurk Education Center. Some sites will also be closed on Monday, Nov. 12, due to an adjusted holiday schedule or because they’re closed on Mondays anyway. Repeat after me—always check ahead to make sure the site you want to visit will be open when you plan to be there. This just in: Ship's Company, the US Brig Niagara living history unit, will be among the groups marching tomorrow morning in Erie's Veterans Day parade. And the cover will be going on the ship for the winter--Cover Day was rescheduled from last week. However you spend this coming weekend, please take a moment to reflect on those who have served our country and on those who work to honor their legacy. As I write this (Nov. 1), sites on the Trails of History are in various stages of dealing with the results of Superstorm Sandy. Overall, we fared pretty well, as far as I know, with less flooding than during last year’s bout with Irene and Lee. However, some sites in the southeastern part of the state are still without electricity. Some are working to clean up fallen trees and other debris. That’s no doubt true for many Trailheads readers, as well. And I’m sure some of you, or people close to you, are dealing with far worse. If you were planning to visit, or attend a program at, one of our sites this weekend, I strongly encourage you to check ahead to be sure everything’s still on schedule. Our colleagues at the Erie Maritime Museum and Flagship Niagara shared, on their Facebook page, their tribute to HMS Bounty, which sank off the coast of North Carolina earlier this week. Built for the film Mutiny on the Bounty (1962), the ship was en route from New London to St. Petersburg when its bilge pump and engine failed. Most of the crew made it into lifeboats and were rescued by the US Coast Guard. One sailor, Claudene Christian, perished and the captain, Robin Walbridge, has not been found. Walbridge served as an engineer on Niagara in 2000, and Bounty participated in Tall Ships Erie 2010 (there’s a photo of Capt. Walbridge in the guest blog post Linda Bolla wrote for Trailheads). The sailing community is a close-knit group, and I know that there are many people affected by this loss. Our hearts go out to all who lost loved ones as a result of this historic storm.